The complexities of the brain and nervous system make neuroscience an inherently interdisciplinary pursuit, one that comprises disparate basic, clinical, and applied disciplines. Behavioral neuroscientists approach the brain and nervous system as instruments of sensation and response; cognitive neuroscientists view the same systems as a solitary computer with a focus on representations and processes. 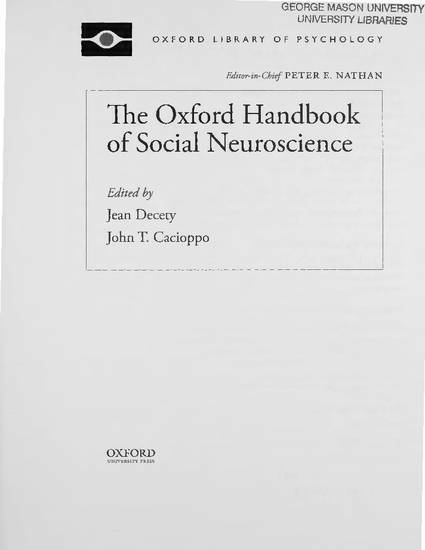 The Oxford Handbook of Social Neuroscience marks the emergence of a third broad perspective in this field. Social neuroscience emphasizes the functions that emerge through the coaction and interaction of conspecifics, the neural mechanisms that underlie these functions, and the commonality and differences across social species and superorganismal structures. With an emphasis on the neural, hormonal, cellular, and genetic mechanisms underlying social behavior, social neuroscience places emphasis on the associations and influences between social and biological levels of organization. This complex interdisciplinary perspective demands theoretical, methodological, statistical, and inferential rigor to effectively integrate basic, clinical, and applied perspectives on the nervous system and brain.